You are currently browsing the tag archive for the ‘barge Pathfinder’ tag. 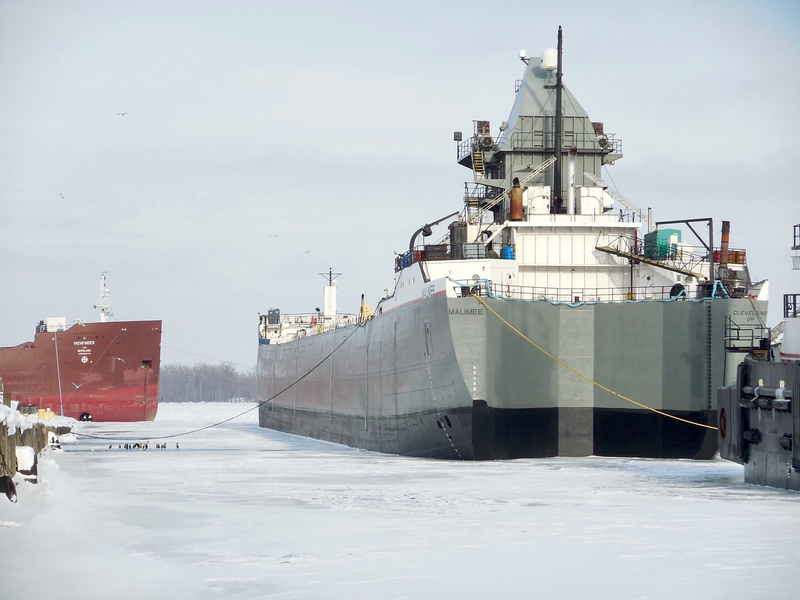 Last winter I planned a trip along the southern shore of Lake Erie, hoping to catch photos of lakers in ice. The results were here, a week after ice out, a schedule that depended on someone else’s time off. It was a fun trip, but the photos I hoped for eluded me. Well, Brian caught them in the photos below. 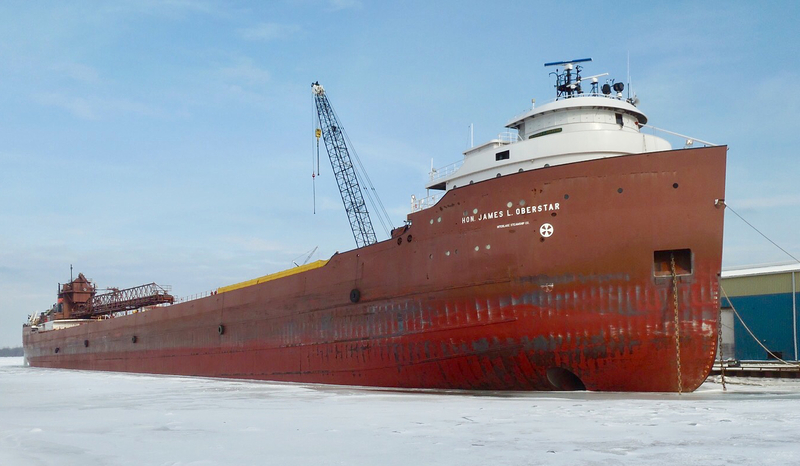 GL New York (1913) and Rhode Island (1930) are frozen in, and Oberstar is so deep in hibernation that her shutters are pulled down. 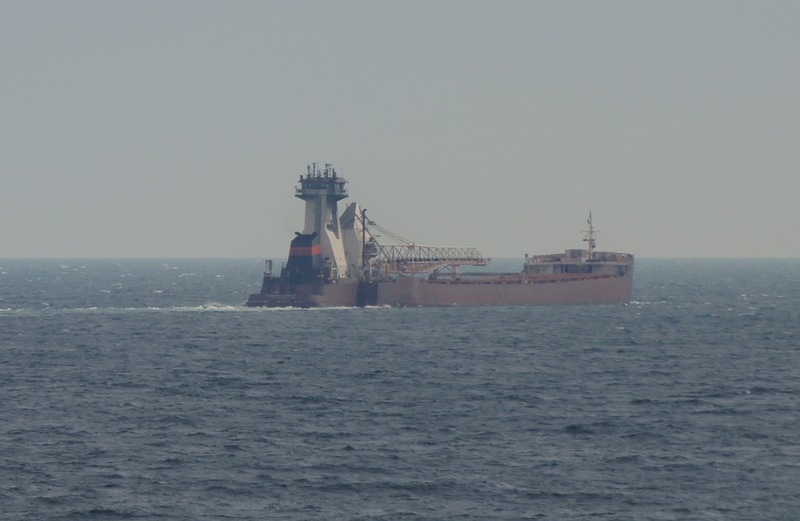 Between the stern of Oberstar and the bow of Presque Ile in the distance, that’s Dorothy Ann, half the ATB with . 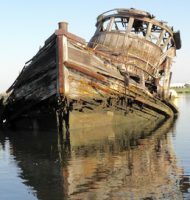 . .
barge Pathfinder, launched in 1953 as the ore boat J. L. Mauthe. 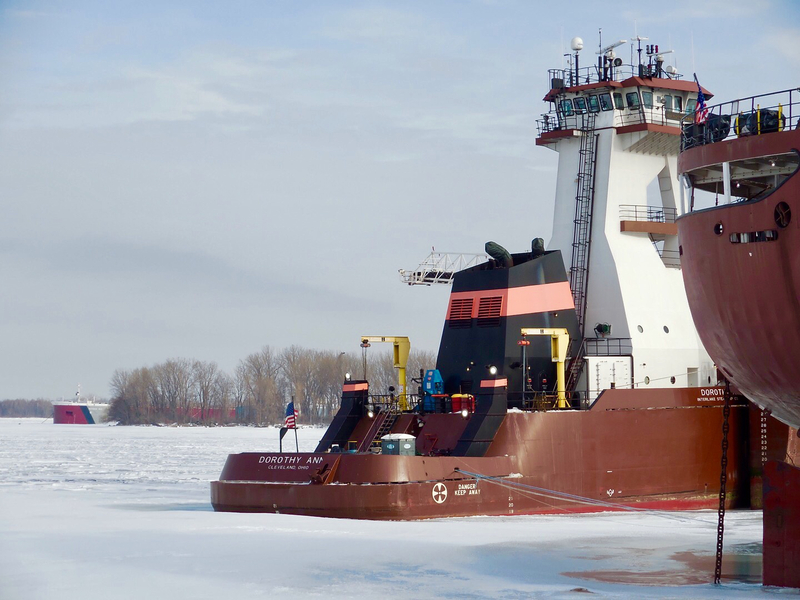 The stern of the newly-renamed barge Maumee clearly shows the deep notch. 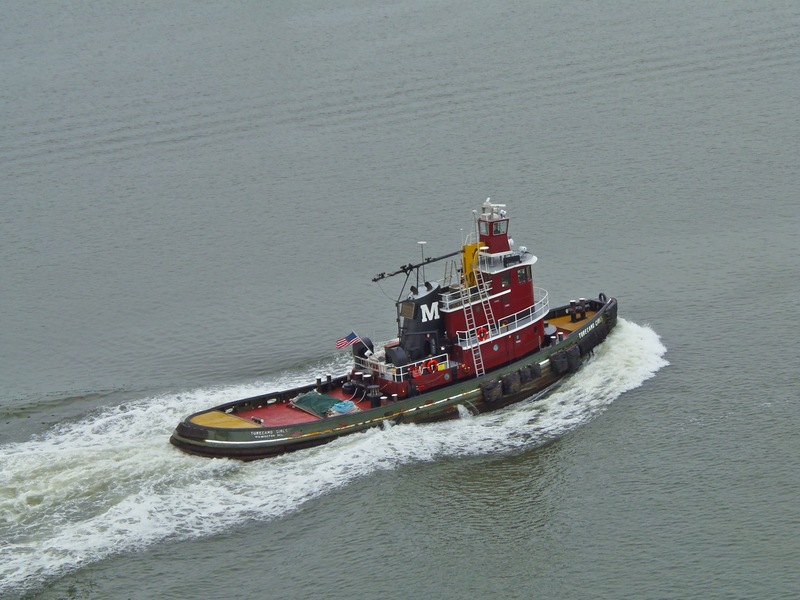 Maumee also started life as a 1953-launched ore boat. 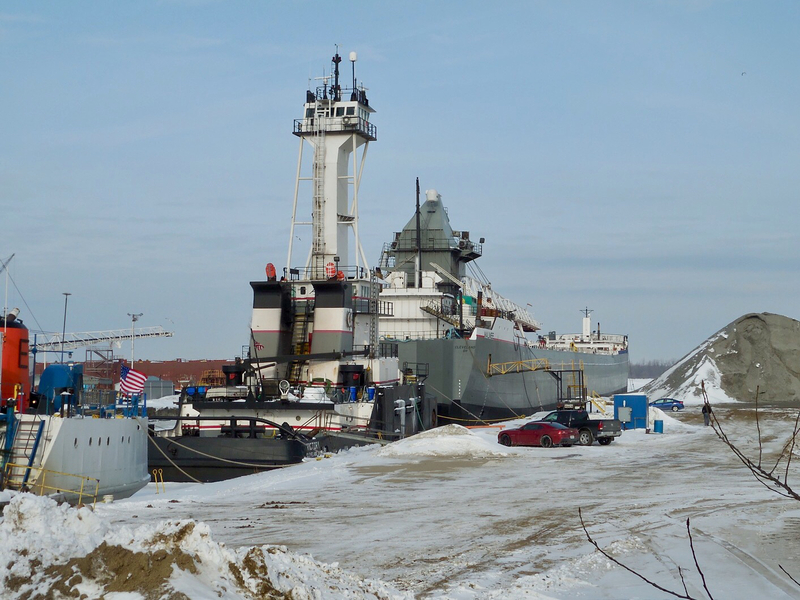 Tug Victory, which worked in salt water for her first 25 years, is laid up here between her barge Maumee, until recently called James L. Kuber, and J. S. St John. Many thanks to Brian for letting me share these photos on tugster. 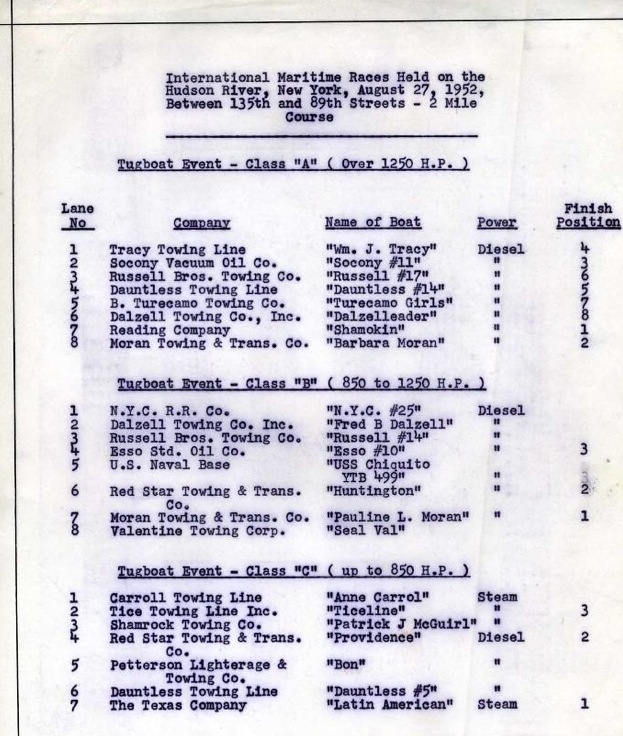 Many thanks to Paul Strubeck for this foto of a preserved “results report” he has . . . from a 60-year-old typewriter! 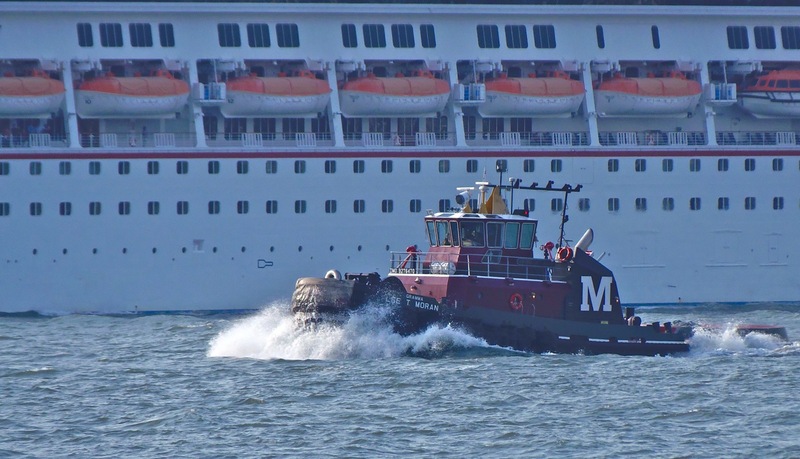 A week from today Working Harbor Committee is sponsoring a great event they call the 20th annual North River Tugboat Race, but clearly there have been more than 19 prior races involving the machinery of the New York City towing industry. How many races have been held? Going in “order of completion,” I’ve managed to find fotos of #2 finisher Barbara Moran and #3 Socony 11 (later Dorothy Elizabeth, shown here racing again in 2007) from Birk and Harold’s site. Also, here’s a foto of a model of #1 Shamokin. And a foto from eBay of Wm. J. Tracy. Finally, here’s a quite forlorn foto of Dalzelleader late in her life. That leaves me without images of finishers 5, 6, and 7: Dauntless 14, Russell 17 and Turecamo Girls of that vintage. Thanks to Charlie Gallo for sending this foto of Mister T (2001) from the east end of the East River, a section of the sixth boro that I’ve inadvertently ignored. I’ve no idea who the T is Mister T is. 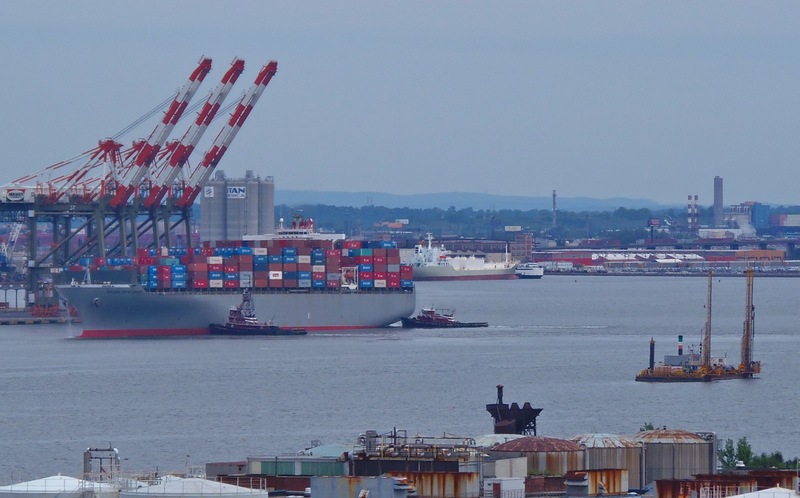 Behind the bridge is SUNY Maritime’s Empire State. Thanks, Charlie. In fact, I’m always looking for new perspectives, like this one from a week ago over southwest Bayonne, showing McAllister Sisters and Ellen McAllister docking Golden Gate Bridge, with Bebedouro and Islander (I think) in the distance. Also, in the foreground, it’s drillboat Kraken. One of the details of ships is their names, like this quite intriguing one. From a similar aerial perspective, enjoy Turecamo Girls (1965). 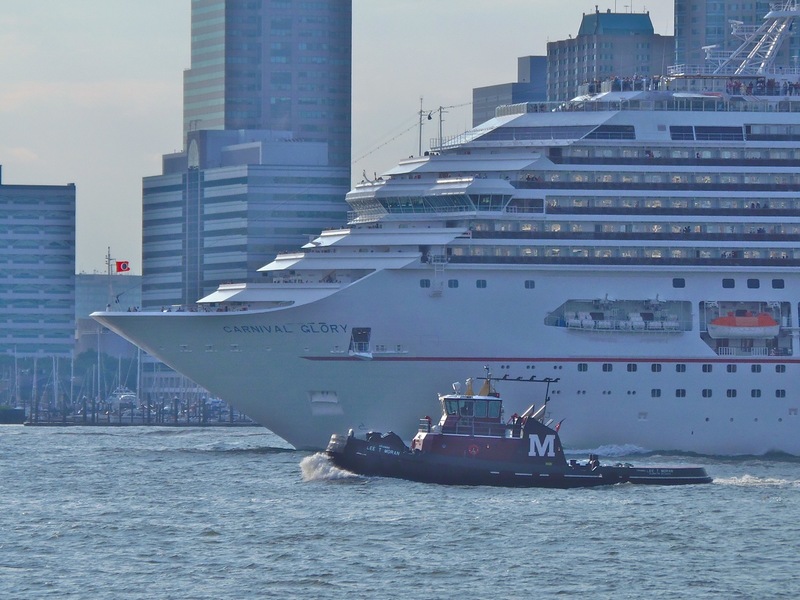 How about an unexpected angle on a frequent subject of this blog, Gramma Lee T Moran, running here with an outbound Carnival Glory. The T in Gramma Lee T is for Tregurtha. 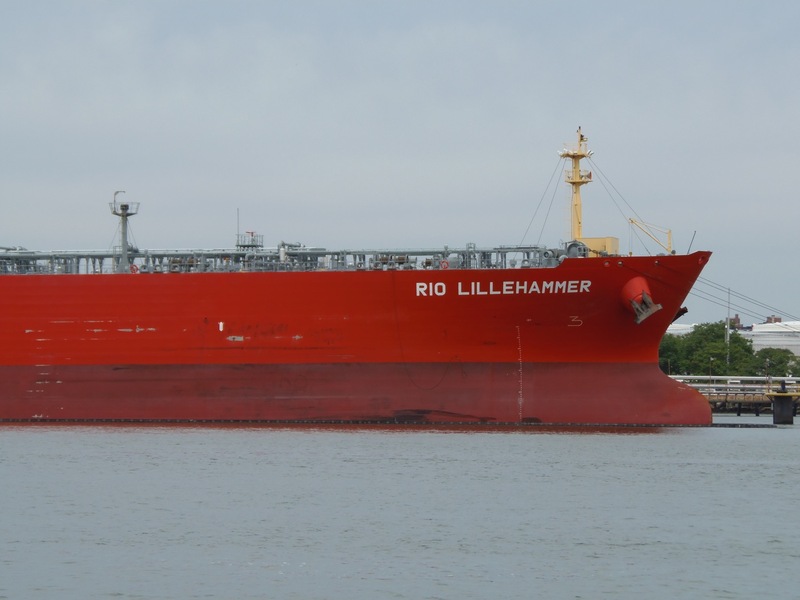 Gramma Lee has this other vessel named for her as well. She was the wife of Paul Tregurtha, a name that you might know from Ken or Isaac’s blog posts on Interlake Steamship Company vessels. 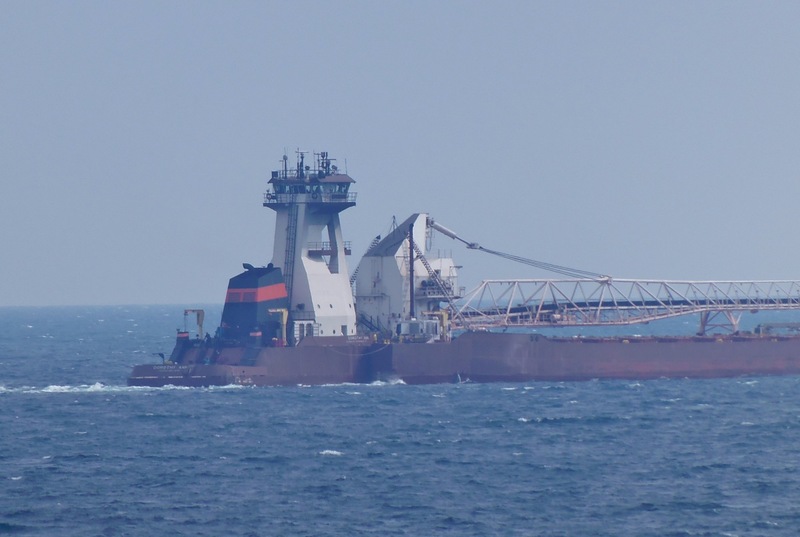 I spotted one such vessel from Badger earlier this week. 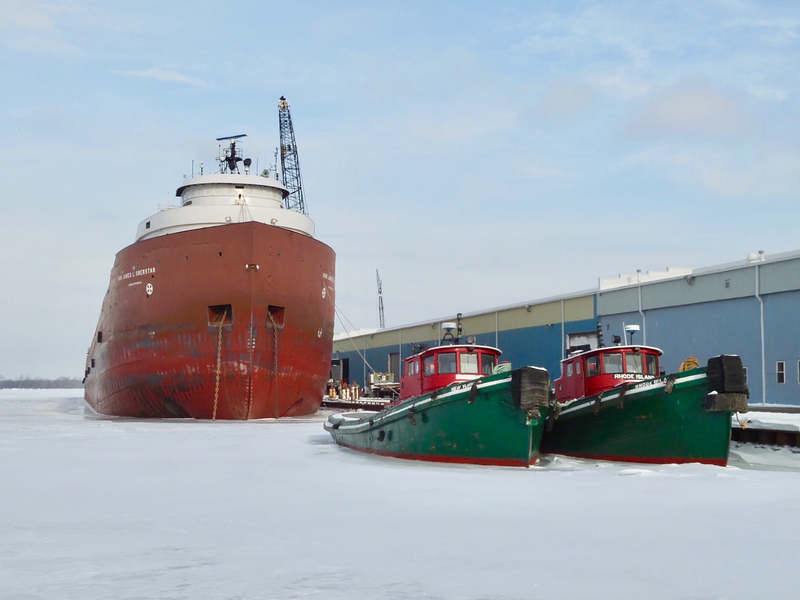 Behold barge Pathfinder and tug Dorothy Ann. 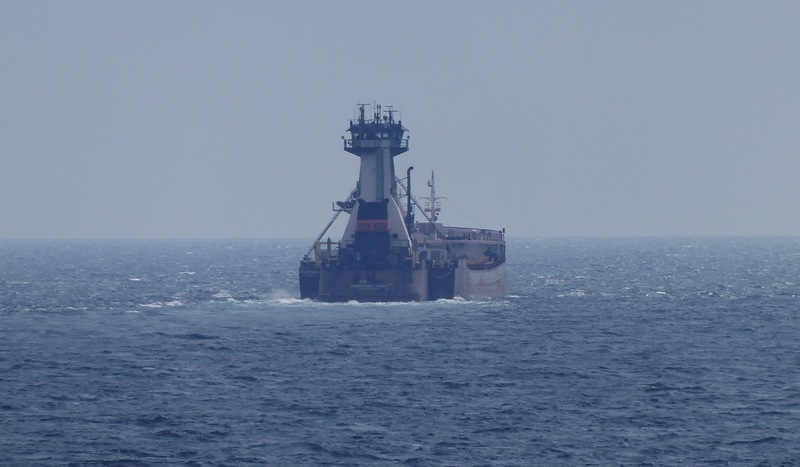 Barge Pathfinder used to be a boat: J. L. Mauthe. Boat-turned-barge Pathfinder now has a detachable engine called Dorothy Ann (1998). As the person behind this blog, I want to step back a bit and thank you all for reading what I post, looking at the fotos, commenting, and sometimes correcting my errors. I’ve enjoyed doing the blog for almost six years and will continue.